“Everyday Tools: Technology for Accessing Education, Employment and Life” was focus of The University of Scranton’s 17th Annual U.S. Conference on disAbility, which took place recently on campus. From left: From left: Lori Bruch, Ed.D., conference co-chair and chair of the Counseling and Human Services Department at the University; Rebecca Spirito Dalgin, Ph.D., conference co-chair and director of the rehabilitation counseling program at the University; Patricia and Edward R. Leahy, honorary conference co-chairs; Debra Pellegrino, Ed.D., dean of the University’s Panuska College of Professional Studies; and Jeff Gingerich, Ph.D., provost and senior vice president for academic affairs. Bern Gavlick, an eighth-grade guidance counselor at FDR Middle School in Bristol Township, has spastic quadriplegic cerebral palsy and used assistive technology for the first time when he was in the first grade. Bill Zeigler, an assistive technology consultant with Bucks County Intermediate Unit 22 in Doylestown and an Apple Distinguished Educator, introduced Gavlick to a device called the “Unicorn board,” which acted as a giant pad that had all of the letters of the alphabet on it so Gavlick could spell out words by touching it. 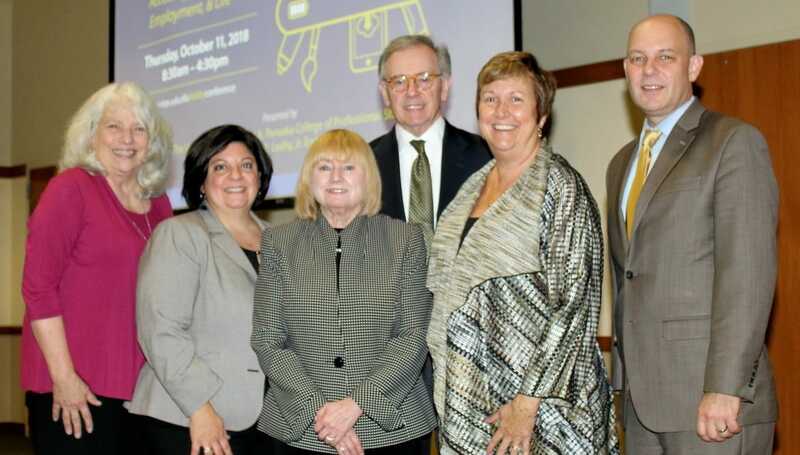 Together, they spoke about how assistive technology helped Gavlick throughout his life in “Working Through the System,” the keynote presentation at The University of Scranton’s 17th annual U.S. Conference on disAbility, which was held Oct. 11 on campus. Later, when Apple released one of their first desktop computers, Zeigler upgraded Gavlick’s technology, attaching a joy stick (mainly used in flight simulators) to the Mac. Gavlick was able to easily navigate and spell out words without using a mouse and keyboard. Gavlick’s cerebral palsy worsened when he was 11 and he was unable to use his hands. Zeigler turned to voice navigation, but unfortunately, the technology was not advanced enough to fully implement word use. Gavlick had to spell out each letter using the military phonetic alphabet to spell one word. Because this process was tedious, Gavlick came up with his own idea on how to spell words faster. He put a pencil in his mouth one day and used it to type on a keyboard. As technology advanced, Gavlick was able to return to voice navigation to make sentences type out on the computer faster. During his time working with assistive technology, Gavlick attended K-12 school and Ursinas College in Collegeville. He only used the assistive technology at home and not while he was at school, saying he would “do things kids would do at his age,” such as ski, swim and help out at his school’s “Gym Night” by bringing out gear for his fellow students to use. The presentation ended with Gavlick and Zeigler showing videos of Gavlick throughout his life, including climbing a rock wall in his high school gym and skiing at Jack Frost Ski Resort. The presentation ended with a Question and Answer session with Gavlick, Zeigler and Gavlick’s parents. The annual U.S. Conference on disAbility brings together national, state, and regional experts to discuss a multifaceted approach to improving employment, independent living and transition for all people with disabilities. The conference is hosted by the University’s Panuska College of Professional Studies with the support of the Edward R. Leahy Jr. Endowment and Honorary Conference Co-Chairs Edward R. and Patricia Leahy.